I am not going to lie….I LOVE the taste of soda. What I don’t love are the added sugars, chemicals and artificial flavorings or sweetener. I stopped drinking soda about 5 years ago and it was a hard decision but I decided my health had to come first. I discovered Zevia about eight months ago at my local health food store and I was so excited to learn that it is sweetened with stevia and does not contain any artificial ingredients. It is truly “the first all natural zero calorie sweetener.” How exciting is that? The first flavor that I tasted was the Zevia Natural Black Cherry and it was so delicious. It has a wonderful carbonation with the fresh taste of black cherries and the perfect touch of sweetness without that artificial “diet” taste. I immediately asked the health food store owner if she could order this for me by the case. My favorite flavors are the Zevia Natural Orange and the Zevia Natural Cola. 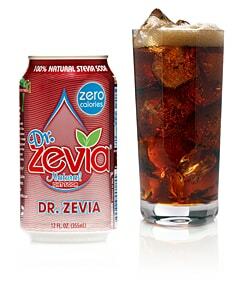 My husband and kids really like the Zevia Natural Rootbeer and the Zevia Natural Ginger Ale. The only flavor that I haven’t tried is the Zevia Natural Twist so I hope to have a chance to try that soon too. My friends think I am nuts but my kids who are 3, 4 and 5 had never tasted regular or diet soda before. Zevia was the first soda that I felt good about giving them as an occasion treat to drink. They loved it! I even made sure to have it on hand to take with us when we went on vacation so that I would always have it on hand in our cooler. Zevia has a website with an interesting section of Frequently Asked Questions and I encourage you to check it out, especially if you would like to learn more about the natural sweetener stevia. Find Zevia at a store near you! Ginger Root Beer is my flavor of choice! i think my favorite flavor would be ginger root beer for sure!